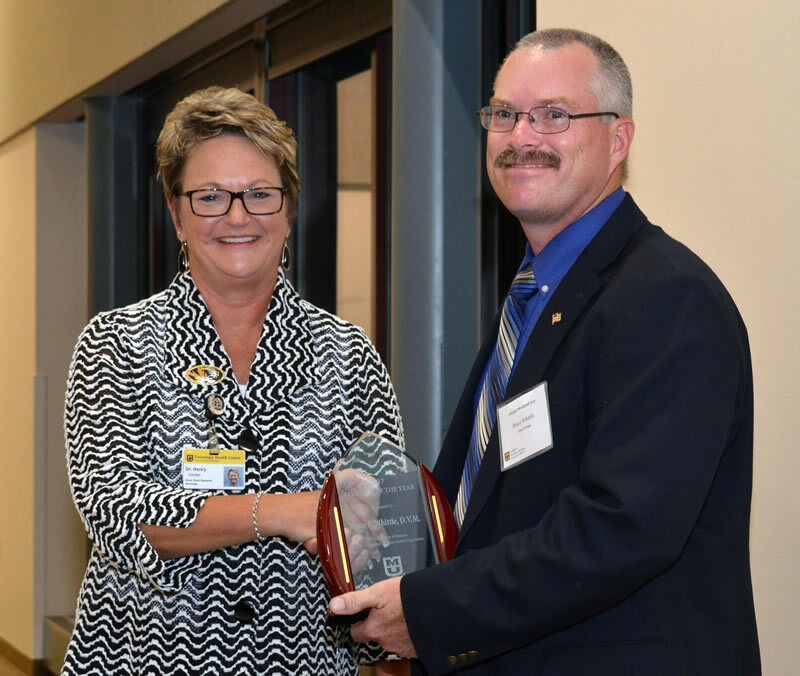 Bruce Whittle, DVM ’94, is the University of Missouri College of Veterinary Medicine 2017 Alumnus of the Year. He was honored during the college’s Alumni Reunion Weekend held Sept. 15-16. 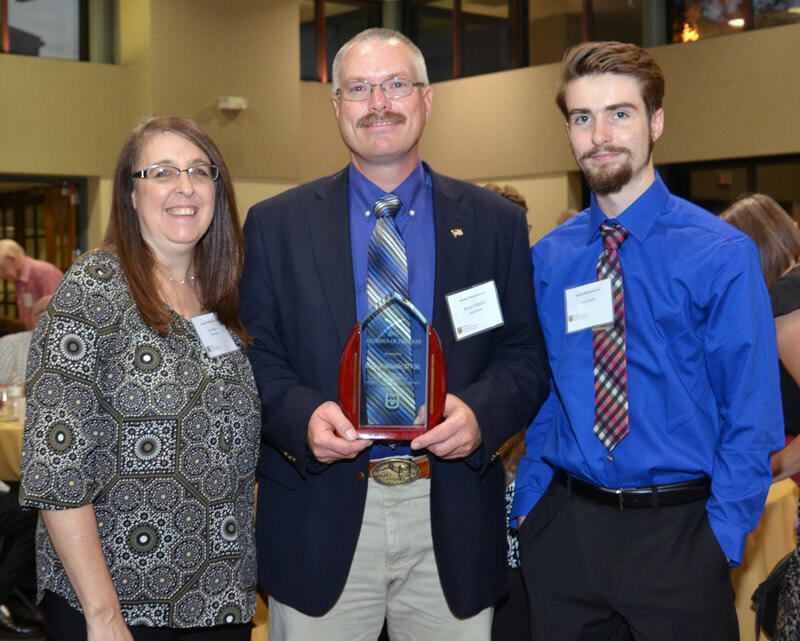 MU College of Veterinary Medicine Alumnus of the Year Bruce Whittle, DVM, is pictured with his wife, Gayla Whittle, DVM, and son Wyatt. Whittle, who was born in Iowa and raised in southeast Missouri between the towns of Diamond and Joplin, attended Northeast Missouri State University in Kirksville for three years before being accepted at the CVM. Both he and his wife, Gayla, earned a doctor of veterinary medicine in 1994. Two weeks after graduation, they moved to Trenton, Missouri, where they established Honey Creek Veterinary Hospital, a mixed animal veterinary practice. In announcing the award, MU CVM Interim Dean Carolyn Henry, DVM, MS, DACVIM, commended Whittle for being a driving force for organized veterinary medicine in Missouri throughout his career. He is a member of the American Veterinary Medical Association and the Missouri Veterinary Medical Association, which he has served as vice president, president-elect, president, and board chair. He has also been a member and chair of the MVMA equine committee and a member and chair of the legislative committee. He is a member of the American Association of Equine Practitioners. He has served on the AAEP equine dentistry committee, the scope of practice task force, the welfare and public policy advisory council as a member and vice chair, and the state legislative issues subcommittee as chair. He also is a member of the American Veterinary Dental Society, the Foundation for Veterinary Dentistry, the Missouri Academy of Veterinary Practice and he is the vice president of the MVMA Academy. MU CVM Interim Dean Carolyn Henry, DVM, MS, DACVIM, presents the Alumnus of the Year Award to Bruce Whittle. As a practitioner, he is renowned for the scope of his expertise, which encompasses small animals, cattle, deer, sheep, goats and horses. He is considered the driving force behind the Missouri Veterinary Medical Association equine dental wet lab. The wet lab serves the dual purpose of advancing dental skills of veterinarians while providing pro bono care for horses on the Humane Society of Missouri rescue ranch. He helps to organize and execute the American Association of Equine Practitioners short course in dentistry for veterinary students. His volunteer work includes helping to teach five days of dental labs for veterinary students at the CVM each year. The Whittles also work with the CVM to provide externship opportunities at their practice to veterinary students seeking practical experience in veterinary medicine. This is the second award the CVM has given to Whittle this year — in June he received the Dean’s Impact Award. In accepting the honor, Whittle thanked his family for their support, which has allowed his extensive involvement in veterinary organizations. He and his wife have two sons. He also thanked his colleagues. 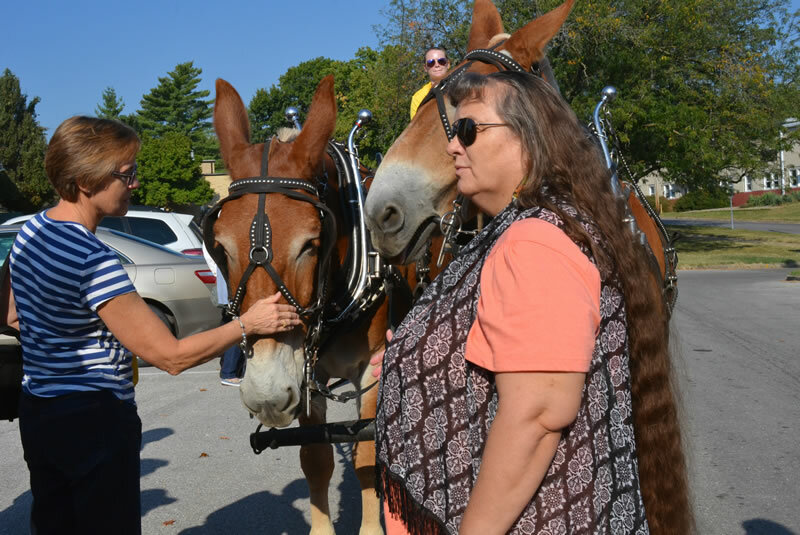 The MU College of Veterinary Medicine Mule Team was on hand at the Alumni Weekend breakfast to provide wagon rides around the CVM campus. The announcement of the Alumnus of the Year Award was made during the reunion banquet held Sept. 15 at the Adams Conference Center. The following morning, alumni were invited to have breakfast with retired faculty members, enjoy rides with the CVM Mule Team, tour the CVM facilities, including the Veterinary Health Center’s three hospitals, and attend the football game versus the Purdue Boilermakers. A photo album from the weekend can be found on our Facebook page.